Colourway has been a Rowan stockist for most of the famous brand's existence and has been an invaluable resource for many thousands of customers over more than thirty years, offering superb technical and design advice through owner Teresa in-store, on the phone, and by email through the website. After training in horticulture and then floristry, Teresa took her knitting and retail skills to iconic designer Patricia Roberts' London store at the height of the explosion in designer knitting then moved to work in, and then buy, London's flagship stockist Colourway. An expert knitter and designer herself, if there's a question she cannot answer it is probably because there isn't one! One of the first yarn stores to venture online 'back in the day', Teresa took advantage of having a new global market place to move away from London to the peace of rural Wales, her London client base becoming the first wave of mail and telephone order clients using the website as a catalogue but maintaining their personal connection with the store. Needless to say Welsh knitters really appreciated being able to see and feel the yarns which had previously been many hours drive away. As for that new global client base, well, twenty minutes after the site launched with absolutely no fanfare, an email arrived from Bermuda asking if delivery there was possible. It was, and that first new overseas friend of Colourway still orders on a regular basis to this day. Colourway not only offers winter and summer yarns year round for those in different climate zones, the support and advice is unparalleled. It is far from unknown for Teresa to solve a problem with a pattern by knitting up a swatch herself , and of course modern mobile phones make sending pictures of the problem so much easier for knitters at their wits end! From colour and pattern adaptation decisions to 'translating' a confusing pattern the depth of expertise and advice we can offer is pretty well unbeatable. As for price, when the last resurgence in popularity for knitting as a craft happened so did a number of large 'internet only' companies who without bricks and mortar overheads could offer some great deals. The Colourway response? A guarantee of a 20% reduction in yarn recommended retail prices across the board, year round, and a 10% guaranteed reduction on design books. And even on top of that there are still occasional sales on discontinued lines and colours where the reductions are even more impressive. Austerity might mean that the shop is painted less often (think of it as shabby chic) but Colourway's customers benefit from permanent 'mate's rates' while all the other support is free!! In rapidly changing times, provision for the future of the business comes in the form of additions to the basic team of Teresa (owner and shop manager) sister Maggie (internet admin and shop stand-in during Teresa's cancer treatments) and Tony (Maggie's husband and technical guru for the website). Teresa's niece Helen and nephew Alex are being trained to be the next generation of Colourway 'treasures' when the current team members start to take a step back from the business over the next few years. 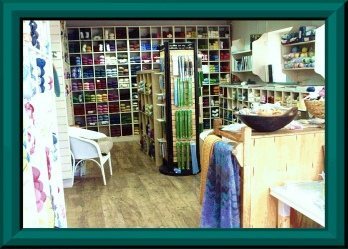 Other businesses may come and go but while there are passionate knitters and crocheters out there, Colourway will be too with their unique blend of experience, friendly personal service and ultra-competitive pricing.